WiFi networks have gained enormous popularity in recent years with both business and home users. They offer some substantial advantages over traditional wired networks and afford their users a high degree of convenience and flexibility. The benefits of a wireless network do not come without a price. There is added complexity required to manage and optimize the network’s performance. You have to deal with issues such as signal leakage, inadequate coverage, rogue access points, and interference. Gone are the days of simply plugging into your wired network. There are tools available which will assist you in managing your WiFi network. They are known as WiFi manager apps and we will discuss some specific tools later in this article. First, let’s take a look at what managing a WiFi network entails. We will also look at how proper management of your wireless network can help alleviate problems and keep your data and devices more secure. Why Should I Manage My WiFi Network? Slow or no Internet access in specific locations that should receive coverage. Slow connection speed throughout the network. No WiFi access at all. Your WiFi network is unprotected and unencrypted. These issues are the symptoms of a problem with your WiFi network. It may be related to the way the network was implemented or in the manner it is currently being used. Some of these issues are more easily addressed than others. Detecting and resolving these issues is the rationale behind managing your WiFi network. What is a WiFi Manager? Signal coverage – This is also known as WiFi heat mapping and lets you see the coverage area of your WiFi signal. Device connections – Providing data on end-users and their devices lets you assess the overall performance of the network and troubleshoot connectivity issues that may arise. Device locations – Using the access points that devices have connected through can give you a picture of the location of the devices throughout the network coverage area. The ability to scale – In order to meet your changing requirements you need to ensure that the tool is flexible and is not limited in the number of access points or size of the coverage area it can monitor and manage. Performance Management – The ability to manage bandwidth can lead to cost savings and enhanced performance. Compliance and reporting – This may not concern the home user, but in an office setting, the ability to produce reports related to usage and other network information can be vitally important. How Can a WiFi Network Manager Help Me? A WiFi manager can help with all of the potential network problems we described previously. Let’s take a look at some of them individually, and indicate how the use of a network manager can help alleviate these issues. Verifying the security of your network – One of the greatest concerns with WiFi networks is their potential to be compromised by unauthorized users. Conducting a survey with the WiFi manager application will alert you to several issues that may result in a network that lacks adequate security. If your network reports that it is open or using WEP security you need to address this immediately and reset your router to employ WPA2 encryption at a minimum. Another potential security issue comes from rogue access points which may be located outside of your building and be unknown to the network administrators. A survey of your WiFi environment can indicate where the signal might be leaking and allowing unauthorized users to attempt to gain access without being seen. Slow or no access in specific areas – Again, a survey performed with a WiFi manager can indicate problem areas within your home or office. Signal strength can be ascertained with a heat map and equipment may need to be relocated in order to provide adequate WiFi access for all of your users. Creating a heat map to find the optimal locations for your router and other equipment should be one of the first steps when planning a new WiFi installation. Generally slow connection speed – This can be a tricky issue to resolve, but using a WiFi manager can help lessen the pain. Slower than expected speed, when connected to your WiFi, can be caused by a number of reasons. Channel overlap – Most WiFi routers use channels 1, 6 or 11. If you conduct a WiFi survey and discover other networks in range, you may be subject to channel overlap which can negatively affect your network’s performance. You can see both the network and the channel it is using in your survey. This enables you to take action by changing your router to use a different channel if you suspect channel overlap. Network bottlenecks – Having the ability to monitor the bandwidth usage of your network users can help pinpoint the reason that the network is slow. Perhaps one of your employees is spending the day watching Netflix or downloading video files at the expense of the rest of your users. Unauthorized users – Even if they do not have malicious intentions, having extra users on your network can adversely impact its performance. A survey conducted with a WiFi manager will alert you to security settings which may need to be updated to restrict users without proper credentials from accessing the network. It will also show you signal leakage that falls outside of your home or facility. These leaks can be responsible for rogue access points and intrusion into your network. Armed with this information, you can take steps to contain your network’s signal. You can use these WiFi manager apps to manage your wireless network from your Mac. This WiFi manager application is an excellent choice for assistance in managing, planning, and installing a WiFi network. 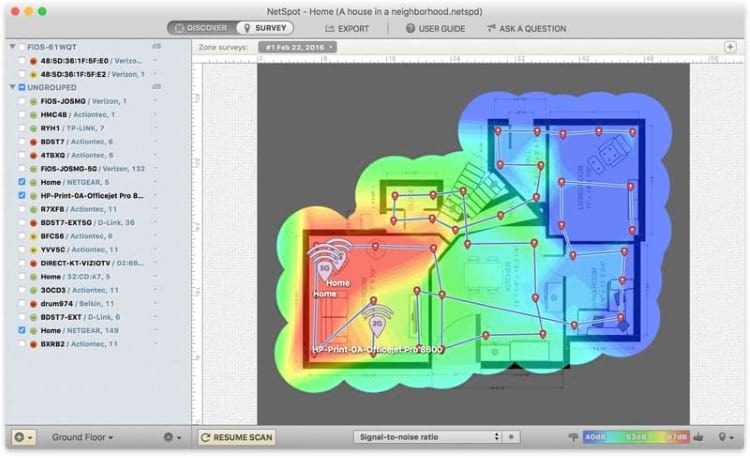 Using the tool you can conduct a survey of your WiFi network and create a heat map to analyze its coverage. It will provide information on the security of your network and can help locate unauthorized access points. The heat map can help you position your router and other network components in the most optimal locations to limit interference and provide reliable connections. The tool can help you monitor bandwidth and channel usage which can be critical in tuning your network. This application is available in free and paid versions that offer varying levels of functionality. 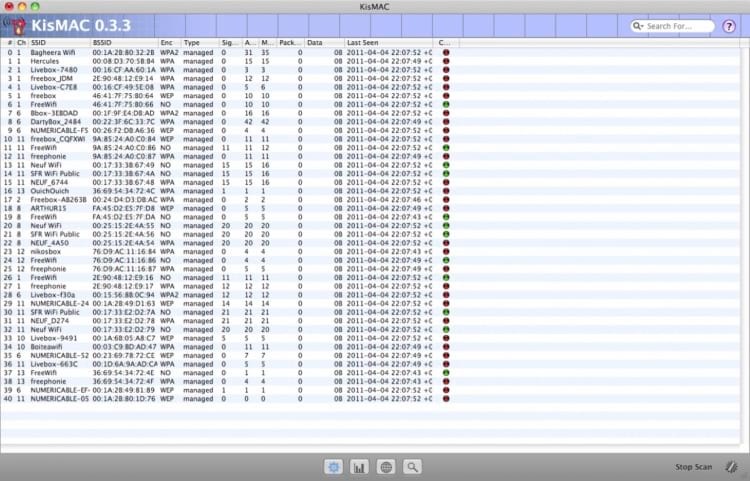 KisMac2 is an open-source, freeware application designed to be run on the macOS. It reports information on channel usage, security settings, and signal coverage. It is not particularly user-friendly and is meant to be used by experienced network administrators. This app can be used to indicate potential signal leaks and to determine WiFi coverage within your home or office to enable you to tune your network optimally. Monitor your network throughput and performance with this WiFi manager for the macOS. You can set alerts to warn you when you are near usage thresholds that you can set. It provides statistics generated from your Mac as well as from network-attached devices such as a router. Periodically save your logs to a file for late analysis. You can try the app for free with a 10-day test-drive. We recommend that you take the time to evaluate your WiFi network with the use of a WiFi manager. It can help you improve your network’s performance and can be an indispensable tool if faced with problems with your WiFi implementation.